What a perfect cast for a love story! Natasha, 17, is slated to be deported from New York City with her family, back to Jamaica. Daniel’s parents immigrated from Korea and had their children in the U.S. They run an African American hair supply store. Despite the injustice and weirdness of this, it turns out that most black hair and beauty stores are owned and run by people from South Korea. 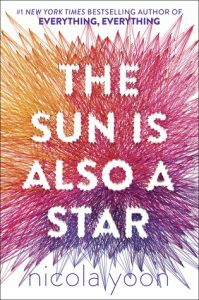 “The Sun is Also A Star” (Delacorte 2016) by Nicola Yoon is told in the alternating voices of romantic Daniel and Natasha who thinks like a scientist. Daniel, the poet, sees Natasha on the street, not at his parents’ shop because she wears her hair in a huge Afro. Whereas Natasha is precise and reasons empirically, she’s also sensual. When she listens to her music she is transported. When she eats Korean food for the first time (with Daniel), she’s close to ecstasy. When they meet, Daniel is making his way uptown to talk to a Yale admittance interviewer—only because his family expects him to become a doctor. Natasha is on her way uptown in a last ditch attempt to rescue her family by talking to a reputedly stellar immigration attorney. Daniel professes his love at first sight, but Natasha is a hard sell. However, she agrees to walk along with him. The two could not be more charming as they get to know each other—she keeping secrets and he wearing his heart on his shoulder. Natasha meets Daniel’s über-strict Korean father and cruel older brother, Charlie, who has just been kicked out of Harvard. Daniel is delivering the bag of money his mother has entrusted to him. The entire story, except for an epilogue, takes place in one day. And you might read this 350-page book in one day. Do not assume that it will resolve in a Hollywood ending. The alternating voices of the couple are interrupted by narrations of a character they’ve met during the day and with little histories—such as why South Koreans dominate African American beauty supply stores. Starting in the 1960s and ever since, straight black Korean hair wigs were extremely popular. At the time, the US government banned the import of wigs containing hair from China. So South Koreans had the monopoly. And the wig business evolved into general hair care business. The story of opposite personalities falling in love sounds like a cliché, but it feels new in Yoon’s hands. No wonder it’s a best seller.